Waikiki Locksmith has a Master Locksmith on call at 377-4936, providing island-wide mobile service. As Waikiki’s premier Locksmith Service, we are proud to offer the most reliable, ethical, and affordable locksmithing in Hawaii - just read our testimonials! 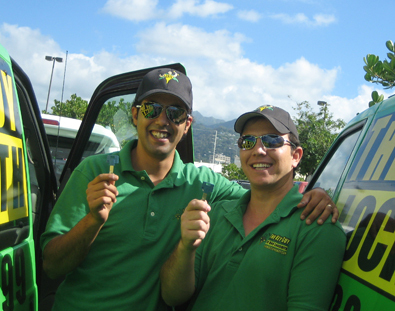 The Key Guy is kama’aina owned and operated by a Certified Master Locksmith, as well as bonded and insured. From cypher locks and card readers to re-keying cars or filing cabinets, Waikiki Locksmith can do it all! All labor can be done right where you are. At your service are Waikiki Locksmith’s full-service mobile workshops, fully equipped with state-of-the-art machinery. Waikiki Locksmith services all types of lock hardware, including locks for vehicles, private homes, condominiums, military and commercial buildings, from one-room studios to multi-floor office buildings. We’re fast, too. A uniformed locksmith arrives on-site usually within 30 minutes to most Oahu locations. Call 377-4936 for free estimates and consultation. Remember, we're key to your security! Waikiki Locksmith is committed to sending only Professional Locksmiths to do all labor on every job. Why? Their expertise can translate to big savings. Why guess and do a job yourself when you can get it done by a professional who uses exactly the right materials for your situation, reducing time and hassle? Waikiki Locksmith does the job right, with professional service, low prices and fast solutions for every security need in Honolulu. Waikiki Locksmith specializes in car lockouts, house lockouts, lock changing, lock installation, lock re-keying, ignition keys, duplicating lost keys, transponder chip keys, VAT keys, master key systems, keyless entry, electronic keypads, access control systems, garage door locks, laser cut keys, intercom systems, high security locks, CCTV, panic devices, peephole installation, deadbolts, high security locks & keys, bump-proof locks, precision key cutting, gates, padlocks, combination locks, mailboxes, file cabinets, door installation, extracting broken keys, car club removal and more. Benefit from our experience--our business hinges on your security. Call us for free estimates and consultation on all services, 548-1999 on Oahu. A Professional Locksmith will arrive at your door usually within 30 minutes to Waikiki 96814 and most Oahu locations. We are at the phone right now, waiting to serve you! Waikiki Locksmith accepts all major credit cards.